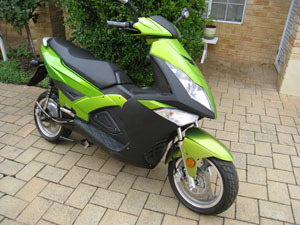 With minimum running and almost no maintenance expenses, electric scooters are very cost effective when compared to conventional transport. Electric scooters are ultra clean with no fuel, oil or CO2 emissions and with no hot parts or exhausts they are especially suitable when children are around. Motor: 5000W brushless hub motor. Battery: 72V 50AH low impedance CHL LFP Lithium battery. Battery Monitor System (BMS) Active. Controller: Sevcon made in UK. Charger: 10A standard 4hrs or 50A 80% 1hr. Max Torque: Up to 180Nm at 200A current. Range: 100kms at 70km/hr 150km at 50kms/hr (Subject to conditions). Climbing Ability: 35 deg. stop start. Brakes: Disc front and back. Tyres: 4.0-13 front and back. Weight: 145kgs. Max. Load 202kgs. Total 345kgs. Battery Warranty: 5 years or 50,000kms.